Live Photo Gallery v Google Picasa. And the winner is….. Arriving at a final conclusion about which one of these two excellent free photo editing programs is superior to the other has certainly not been easy. Until recently I would have definitely chosen Windows Live Photo Gallery, simply because of its ability to upload your photos to so many other photo hosting sites such as flickr and Facebook and its inbuilt panoramic photo stitching ability. It has been the mainstay for all of my photo editing for as long as it has been available to use, but since the recent new updates to Picasa such as the excellent People tagging which recognises the same faces in your photos and the easy to use Geotagging feature, I have to choose Picasa. 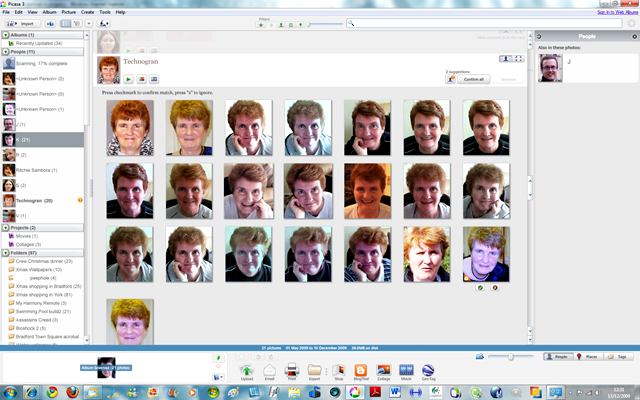 The new facial recognition is so time saving, requiring the user to only tag a few photos of a particular person in order to enable Picasa to then find other instances of that face then tag all other instances automatically, or if it is not sure, suggesting to the user all other instances. This is a boon if you have lots of photos of a person. The Geotagging feature is so easy to do as well, being right there on the viewing page. 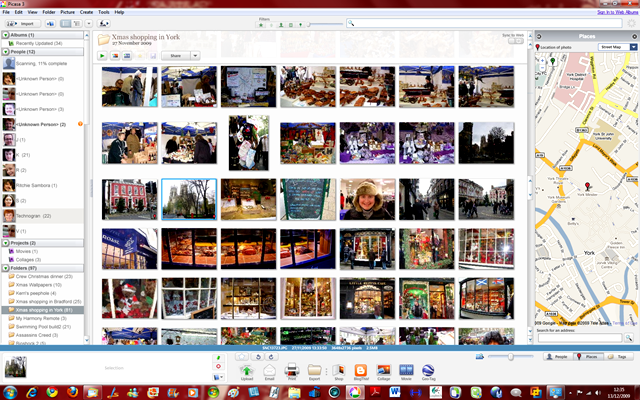 Since I began to compare both of these programs, Picasa has received two new updates. Contrast this with Live Photo Gallery which has not been updated with any new features for nearly a year. That means that even if Geotagging and people recognition were introduced into Photo Gallery in the next Wave 4 update, supposedly scheduled for sometime next year, it then means that Photo Gallery would in essence be playing ‘catch up’ with Picasa. My only gripe with Picasa is that it doesn’t allow you to publish your photos to outside sites such as Flickr or Facebook, by default you have to upload to your Picasa Web albums, although this can be worked around by simply downloading the PixelPipe plug in to Picasa and then enabling Flickr and Facebook sites (or any other site that you happen to use) into PixelPipe. The default extras available in each program tend to balance one another out. Picasa contains an excellent Collage feature by default, whereas Photo Gallery has the ability to create a panoramic photo. Both allow you to make a movie using your photos and both of the Movie features are fairly easy to get to grips with even for a new user. There are other extras available for Photo Gallery such as Auto Collage and Photosynth which can be downloaded from HERE but they are not currently built into Photo Gallery by default. Also Auto Collage is not free to use at this time. I am hoping and keeping my fingers crossed that in the new Wave 4 updates to LIve Gallery the following will be included into Photo Gallery by default. Auto Collage incorporated, Geotagging inside the Live Gallery window using the excellent Bing maps, Photosynth also included and people tagging being able to (as in Picasa) recognise the same face in all of your photos after you have tagged just a few. Then my conclusions would obviously be completely different, but as these two excellent free photo editing applications stand at this point in time and in light of the recent updates made to it, I have to choose Google’s Picasa.